The maintenance of content in a network with more than 2 billion users is a continuous process. Then where is Facebook in its efforts to clean up publications that violate its rules and to minimize the false news? To answer this question, the social network has shared an updated picture of how the company is working to clean up your NewsFeed, in addition to announce improvements to Messenger and Instagram. The updates incorporate more data to determine the quality of the links, expand the data verification of third-party, add indicators of publications of the trust, and to warn those who use Messenger when a user is verified. The list of updates, both recent and future, continues with the strategy of Facebook to “Eliminate, Reduce and Report”. The social network explains that the content that goes against their Community guidelines is removed, while posts that do not violate those rules, but often lead to complaints from users (such as ads, clickbait), are reduced or minimized at the source of the news. The strategy report adds tools to help users to understand what they are seeing. Facebook will also begin to develop tools for collaboration that help to combat fake news or fake news. The network is currently working with experts to develop a system that will help to find false news more quickly. The existing program of data verification of third parties is also expanding, with the Associated Press to expand the efforts by the erroneous information within videos, as well as support for publications in Spanish. Facebook also recently added Confidence Indicators to the button of context “i” that accompanies the publications, which will be created by a group of news organizations called Trust Project, which used factors such as the practices of verifying facts, ethical statements and corrections, as well as who owns and finances the publication. Other changes apply specifically to groups. A new feature called Quality Group highlights publications deleted and false news, as a tool for administrators. Groups who share false information repeatedly will also be dropped from the news source. In addition, users who leave a group will now be able to delete your posts and comments, with access to the delete option even after you leave. In regard to Messenger, you will now have a badge for the audited accounts. In addition, the bulk messages will be easier to detect, thanks to a tag that indicates whether a message was forwarded, a change that was already launched at the beginning of this year. 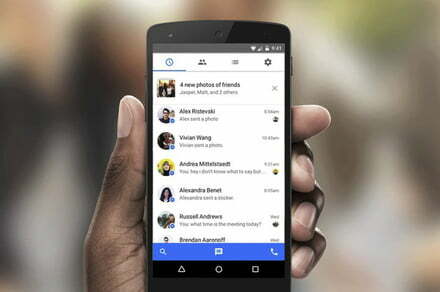 The expanded configuration of Messenger gives users more control over who can send messages, while the blocking tool will also see improvements. For Instagram, the company says that the posts inappropriate that do not violate the standards of the community are excluded in the pages of Explore, as well as in the pages of labels. Facebook is also implementing a resource that allows you to track the progress and changes in the community standards of the platform. The standards are reviewed periodically and are updated according to the recommendations of the experts, trends and other elements.